Those were stirring times, about a century ago, when the big Haida war canoes, each hollowed out of a single cedar tree and manned by fifty or sixty warriors, traded and raided up and down the coast from Sitka in the north to the delta of the Fraser River in the south. Each usually carried a shaman or medicine man to catch and destroy the souls of enemies before an impending battle; and the women who sometimes accompanied the warriors fought as savagely as their husbands. 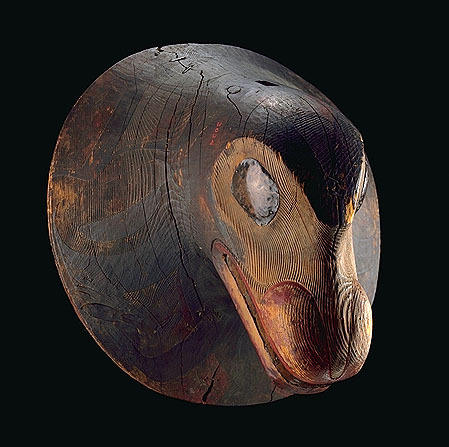 The Haida went to war to acquire objects of wealth, such as coppers and Chilkat blankets, that were in short supply on the islands, but primarily for slaves, who enhanced their productivity or were traded to other tribes. High-ranking captives were also the source of other property received in ransom such as crest designs, dances and songs. Even prehistorically, the Haida engaged in sea battles. They tied cedar bark ropes to heavy stone rings that were hurled to smash enemy canoes and that could quickly be retrieved for subsequent throws. A stone weighing 18 to 23 kg (40 to 50 pounds) could shatter the side of a dugout canoe and cause it to founder. Most tribes avoided sea battles with the Haida and tried to lure them ashore for a more equitable fight. The Tsimshian developed a signal-fire system to alert their villages on the Skeena River as soon as Haida invaders reached the mainland. As early as 1795, a British trading ship fired its cannons at a village in the central part of the archipelago because some of the crew had been killed by the inhabitants, and the survivors had to put hastily to sea when the Indians fired back at them. They found out later that the Indians had used a cannon and ammunition pilfered from an American Schooner a few years earlier. Swivel guns were added to many Haida war canoes, although initially the recoil on discharge caused the hulls of many craft to split. Fortified sites were part of the defensive strategy of all Northwest Coast groups for at least 2,000 years. Captain James Cook was so impressed with one Haida fort off the west coast of Graham Island that he called it Hippah Island after the Maori forts he had seen in New Zealand. Military defences at Haida forts included stout palisades, rolling top-log defences, heavy trapdoors and fighting platforms supplied with stores of large boulders to hurl at invaders. 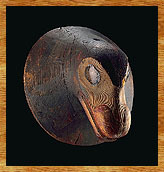 This heavy wooden war helmet in the form of a Seal's head, with copper eyes and teeth, was probably made around 1820 and preserved as an heirloom. Collected on Haida Gwaii in 1897 by Charles F. Newcombe. Warriors wore various kinds of armour including war helmets, wooden visors to protect their necks, and breastplates that were often concealed under a leather tunic emblazoned with their crests. Few Haida wooden slat breastplates have survived, although numerous Tlingit examples exist in museums. There are, however, many Haida painted leather tunics. Haida body armour favoured the war coat, which was made of the thick hides of sea lions or of several layers of elkskin. The former was available through trade on the Nass River while the latter was acquired from European and American traders who obtained them from tribes at the mouth of the Columbia River. The full outfit of a north coast warrior: a round wooden helmet, a bentwood visor, and a painted leather tunic over a breastplate made of interlocking wooden slats. This type of armour had its origins in the bronze age of China and Japan. 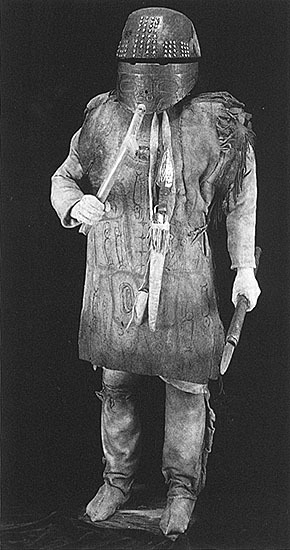 Its use in the New World was limited to the west coast, but elements of the outfit, particularly wooden slat breastplates, spread as far south as California. The Haida replaced the bow and arrow and short spear with firearms as soon as they became available early in the nineteenth century, and some proud owners carved their crests onto the stocks of their muskets. War daggers, however, continued to be used in close combat, and many hundreds of them have been collected from northern tribes. These daggers became something of an art form in themselves and were treasured for many generations within the families of chiefs. The descendants of the famous Tsimshian Chief Legaic kept his war dagger until the 1980s, when its value had climbed to over a hundred thousand dollars. By the 1830s, endemic warfare had given way to the Pax Britannica on the Northwest Coast, as warfare became too costly for the land-based fur traders to tolerate. John R. Swanton was struck by the similarity between war and potlatching among the Haida: "Feasts . . . and the potlatches were the Haida roads to greatness more than war. The latter, when not waged to avenge injuries, was simply a means of increasing their power to give the former."